XS925 first flew on 26th January 1967 and served 5 and 11 Squadrons. The RAF Museum finally took her on in the 1990s, being strangely reluctant to do so initially, and incredibly disposed of their P.1B XA847 to make room for her. 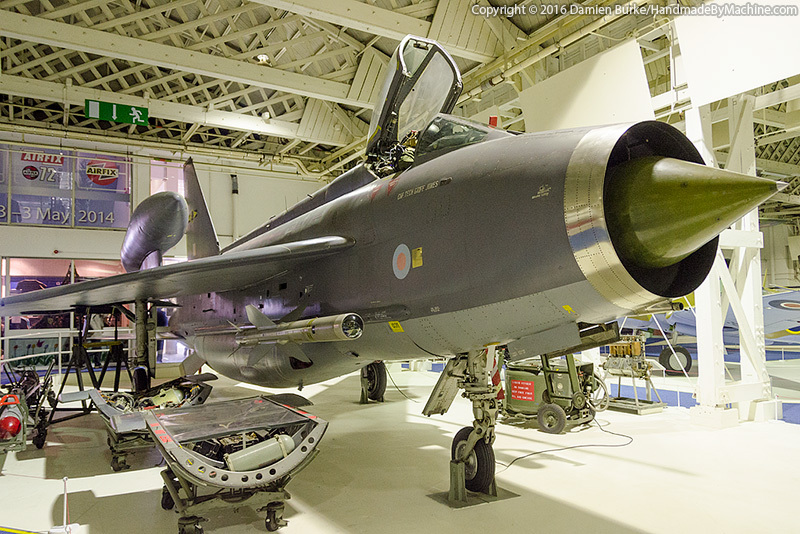 Preserved in her final 11 Squadron markings (the last operational Lightning squadron), she's nicely surrounded by various bits of Lightning kit including Red Top and Firestreak missiles, a gun pack and ejector seat. Happily the massive perspex guard placed in front of the aircraft has been removed - sadly, they've removed her pitot probe instead. Personally I'd say if you couldn't see that probe, you deserve to get a smack in the head anyway, and removing pieces of exhibits to stop idiots walking into them is a pretty poor policy decision.